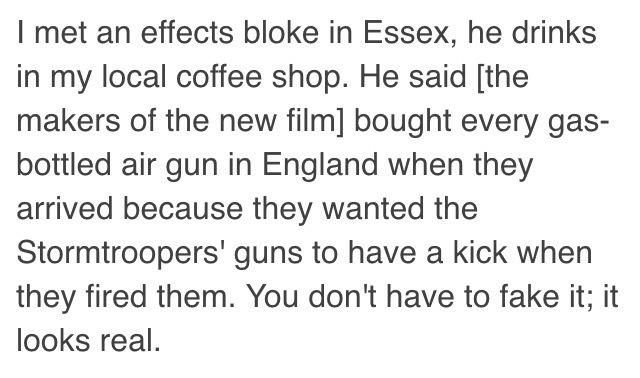 The Star Wars: The Force Awakens crew bought up all the air guns in England for Stormtroopers! That’s a cool detail that will make the troopers reactive and alive. I don’t think its the most important detail of all time, but it just goes to show the detail the production is taking to make sure the universe feels as real as can be. It is no secret the production is attempting to bring back the feel and look of Star Wars: A New Hope, Star Wars: The Empire Strikes Back, and Star Wars: Return of the Jedi with the newest installment.